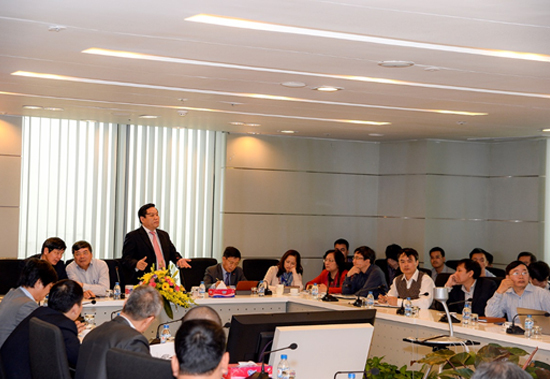 On 17th March 2016, PVEP’s Exploration Division hosted a cyber Seminar between locations in Hanoi and Ho Chi Minh City for summing up the Exploration activities on the period of 2011-2015. Attending the seminar were the representatives of Petroleum Exploration and Production Department of Ministry of Industry and Trade, EPVN’s Divisions of Exploration, Petroleum contract and aboard petroleum project. For PVEP were Dr. Hoang Ngoc Dang, Chairman of Board of Directors; Dr. Ngo Huu Hai, President & CEO, Leaders of Board of Directors and Executive Board; the representatives of functional Divisions, Units and JOCs. The Seminar reviewed the results of implementing exploration and exploitation activities of projects in both domestic and overseas and then summarized lessons learned as well as oriented for the works in the next phase, especially in the context of the current oil price fall. After the presentation of Exploration Division and other functional ones, leaders highly appreciated the results of exploration work during the years 2011 - 2015, especially the new discoveries in the Cuu Long Basin as Kinh Ngu Vang, Kinh Ngu Trang, Kinh Ngu Nam Trang, Lac Da Vang and new Ky Lan in the northern of Song Hong Basin also. These discoveries belonged to the contracts that the PVEP holds 100% interest and full operator itself. For the plan in the next years, in the context of less discovery, Dr. Hoang Ngoc Dang stressed the importance of promotion of specialized-trained-human resources in order to catch the requires of increasingly difficult exploration work. Dr. Ngo Huu Hai said that PVEP should make good use of the available infrastructure in being-exploited basin of Cuu Long and Nam Con Son aimed to extend the exploration reserves and put the new discoveries into development and exploitation as soon as possible. After the ideas and directions of leaders, Dr. Nguyen Tien Long, PVEP’s Vice President in charge of Exploration Division, entrusted this Division in close collaboration with units that are directly operating the projects of PVEP and PVEP Song Hong, PVEP OVS, PVEP POC to further promote the study and update oil and gas potential at the existing contracts for more efficient exploration work in the coming years.